Create your own big bang in the classroom with our lesson ideas, including making edible meterorites and studying real lunar rocks. 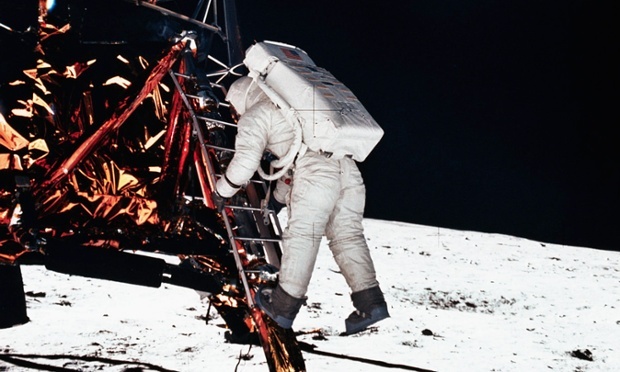 When Apollo 11 astronauts Neil Armstrong and Buzz Aldrin landed on the dusty surface of the moon, Armstrong summed up the epochal event with the famous words “that’s one small step for man, one giant leap for mankind”. The first moon landing will be remembered for centuries to come and this summer (Monday 20 July 2015) marks 46 years since it happened. The anniversary is a great launching pad for teaching about outer space. We’ve gathered a few creative intergalactic lesson plans below – including edible meteorites and studying real lunar rocks. Our list isn’t exhaustive, however, so feel free to offer your own ideas in the comments thread below, or tweet us your favourites @GuardianTeach. Get engagement levels soaring by bringing in real moon rock. The Science & Technology Facilities Council loans out moon rock, brought back to Earth by Nasa’s Apollo astronauts in the late 1960s and early 1970s, free of charge. Advice on the website says that teachers should reserve samples four months in advance, and each loan comes with a wide range of support materials including books and DVDs. For example, as part of the Earth science unit at key stages 2 and 3 you can use the rocks to hold a talk exploring what lunar idioms and expressions mean. Teach about the differences and similarities between the Earth and the moon, as well as whether humans could survive there. There are plenty of ideas here on how to use the samples with secondary students. Explore chondrules and fusion crust by making edible meteorites from peanut brittle and chocolate brownies. This resource, designed by Nasa, is aimed at 10- and 14-year-olds (fifth to eighth grades) in the US to help teaching the exploring meteorite mysteries unit. It can easily be adapted for other curriculums, however, including the Earth science unit in the UK. First, grab an apron and get baking; the meteorite recipes can be found here. Once you’ve got your edible samples, each representing a type of meteorite (eg rice cereal as meteoritic breccia), pop them in plastic bags for teams to study and write notes about, putting together short geological descriptions and sketches of their specimen. What’s its density? Is it porous? Cut the edible meteorites in half so students can describe what they are like inside, but make sure they use technical vocabulary not culinary terms. This is a great way to teach scientific language and get students more familiar with these types of rocks. Find out more about the lesson in full here. Consider the critical role that natural cycles on Earth play in the survival of all living organisms by getting your class to design a space habitat. The Science in School teaching resource is suitable for all ages, with special guidance on using the resource for different year groups. Begin by getting your class to think about what humans need to survive on planet Earth (water, sunlight, oxygen etc) and how these needs could be met in space. First they need to decide whether they want to build their habitat on Mars or the moon because the design requirements for each will differ. For primary explorers, build habitats out of cardboard with sticky tape and get them to decorate their designs. With older students, include a description of the different technologies needed for the habitat, eg an electrolyser to produce oxygen from water. This resource is great for exploring all sciences but can be particularly useful for key stage 3 physics when teaching about gravity and the seasons. This idea came from teacher Laura Dalchow, head of science at Holland junior school in Surrey, who set up an astronaut training facility for her year 5s. “Each child was given a Nasa pass with QI code on it to make it look more technical,” she says. They were then given a schedule for the day telling them where they should be and at what time. Every activity of the day was space-related (to fit in with the year 5 space curriculum) and they were awarded a gold star for passing each session. No space lesson would be complete without an obligatory rocket-making lesson. Nasa has lots of resources to help you do this, and if you’re feeling particularly ambitious you could try launchable rockets too. Primary children might enjoy making some rocket mice using this handy sheet from the Science Museum. And if all else fails, use song.